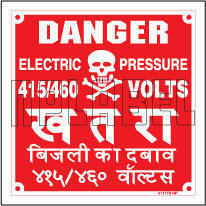 Danger Board with White Background and red letters. 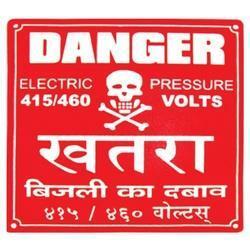 We offer Vitreous enameled danger (caution) Board of all rating and sizes. These boards can be of different shapes and designs. These boards have a long life and are graffiti proof. The colors are fast, weather resistant and don't fade even when exposed to the sun or the rain. We are counted as one of the most reliable organization involved in offering danger boards. These products are in conformity with defined industrial standards. Our range of danger boards are of superior quality and enameled coated. These products are used in power sector. Further, these products are supplied in cardboard boxes to protect from any damage. These products can be customized and are of competitive price. Being a trustworthy entity of this domain, "Panna and Sons" (ISO 9001:2008 Certified) is known for manufacturing, supplying and trading the finest quality of Danger Plate. Manufactured as per the industry laid norms at the Panna & Sons end, the Danger Plate is known for its dimensional accuracy and durable construction. Backed by years of industry experience, we are engaged in offering a premium quality range of Danger Board. Being a leader in the industry, we are engaged in offering a qualitative range of Danger Plate to our clients.